Add to your collection with these custom matchbox-sized cars that you make yourself! Every car buff has a favorite model, and with this variety, you're sure to find yours. 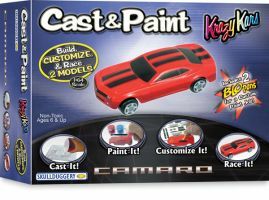 Cast your vehicle's body with the detailed molds, then give it your own custom paint job - and once it's done, get ready to race!